This thread will contain all the information you need to know about our division, and will be updated frequently. Welcome, here are a few things that you should know. As a new trial member or recruit to the Diablo II division we welcome you to our community. As a member we hope you will strive to be Good mannered, active, and overall have a positive experience with our members. As part of our community you'll be invited or messaged about events that will be upcoming such as Ironmans, Walkthroughs, LLD, and pretty much anything else we can think of that might be fun for our members to do together. ( ts3.overdosed.net) and will also be up to date on our main website. Interested in joining or becoming a recruiter? Here is a step by step process that recruiters can follow, as well as those wanting to join. 1=First off welcome to Clan Overdosed! We are a welcoming community and we welcome all into the clan, the new, the old, the bad and the good. 2=Do you use any mods bots or hacks? OD is a GM and legit clan and we have 0 tolerance for any 3rd party programs. Dual clanning is also not allowed. 3=Clan OD keeps track of all our members past and present. Our website contains info on our rules and members. Ranks, trial periods and votes are all recorded here. 4=Once approved you will be on "trial" for 14 days in which you will be voted on by other members.You cannot ask for votes so hang out in channel and game with us for your votes. 5=Promotions are automatic every 7 days with activity up to staff sergeant. After that it will be up to your peers and leaders to promote you based off performance. 6=You will need to make a new account with (OD) at the end of your name. This is the name you will use at the site and in game. 7=Account name should not have more than 12 letters ending with (OD) in caps. 12 letters max will allow for multiple accounts ending with (OD)1 etc. 8=Now please go to our website, Overdosed.net and click "register" fill out required info and add your recruiter and submit. Make sure you put Diablo2 as your main game. Must use your own email when registering. 9=Make sure to read all the rules there after you've registered. Also you can read about our clan history and our members. 10=Once all this is completed your recruiter will approve you. 11=We have a forum site as well, you will need to make account there too using same name. You can find it by clicking forum from Overdosed.net website. Make a post there introducing yourself. 12=Download Teamspeak 3 if you can.This is where most people communicate and will make your stay more enjoyable. You can find TS info on our website. 13=Now its time to make your new D2 account. Character names need to be formatted like this: OD-yourname. Ok bring your new character back to this channel so you can set up your player profile. 14= Right cick on your char and in the description add this info: Recruiter: "Your recruiters name" then press enter and type Date Recruited: "todays date" press enter then type Rank: Trial Member. Then press ok.
15=If you encounter any problems reach out to Sassy, Dabomb, PoPs, DBZ, , or any other person that is warrant officer or higher. 16=Welcome to our community! If you have questions your recruiter can help you. There is plenty of clan members willing to help. Type /home clan od to set your home channel. They will then be taken here to fill these things out (pic self explanatory) make sure main game is correct before accepting their application, and make sure they put you (the recruiter) as their recruiter DO NOT ACCEPT APPS FROM PEOPLE YOU HAVEN'T TALKED TO! You will then receive the application under your recruitment console, make sure everything is in order and then accept it. But the process does not end here! As a recruiter it is your job to look after your recruit, answer their questions as they go through our ranks and teach them everything they need to know to succeed within the clan. All of the rules labeled here will be upheld at ALL times, whether they’re in game, in the channel, in ventrilo, or on the site/forums. 1. All OD Rules are applicable within the Diablo 2 division, and none will be broken. a. Insulting of another member, or non member alike. b. Any form of putting another member/non member down and/or belittling them in any way. c. Any form of Racism towards another member/non member. This includes any form of the N word. It’s not acceptable. d. Not showing respect to any member who deserves the respect. 3. Hacking is strictly prohibited within the clan. Any 3rd part program that modifies the game experience in any way is banned. If it violates the Terms and Use of Diablo II, it’s also prohibited within OD. a. The only exception is sandbox. It is the only 3rd party program supported. 4. All characters and accounts must be tagged properly. Account = Aerineth(OD) and Character OD-Phantom. a. Unacceptable forms of tagging include od-, od_, OD_, Od_, oD_, Od-, oD-. b. Any improperly tagged characters will be asked to remake the character name. c. There are NO exceptions to this rule. d. Any char not renamed after being asked to change it several times, will be kicked from the channel when an OP or Officer sees it in the channel. 5. All level jobs are forbidden from the use of bots. The clan channel has rules of its own. And they’ll be upheld strictly. There will be no slacking on enforcing the rules in the Clan Channel. All Officers and higher have access to the Channel Operators. Access to the Channel Operators is given by rank, not by request. So do not ask for access. If there is any abuse at all of the access given to you as an Officer, it will be removed on all bots. 1. Do not spam the channel with unnecessary messages. a. Try to condense your messages the best you can, so that you don’t have 20 one word messages. This will make the channel much easier to read and your responses easier to understand. 2. Do NOT bm ANYONE in the channel, Clan Member or not. This will be enforced very strictly. a. You will have 1 warning only. b. Repeated bm, and you will be kicked from the channel. c. Even further bm, you will be given a time ban. Usually 24 hours. d. If you still continue to bm in the channel you will be demoted. e. Raging about the punishments received if you break any rules will result in a ban, demotion, and possibly worse, depending on the severity of the rage. 3. While there’s no rule in OD that states you cannot use foul language, do keep it in check. Don’t send messages that contain overly foul language. Try to keep it relatively clean. We are not Nazi’s, but there’s no need to swear every other word in your message. 4. Channel Operator access is a privilege! Any privilege can be removed. Just because you’ve achieved Warrant Officer, Officer, Senior Officer, General rank, does NOT mean you’re immune to having your access revoked. Chain of command refers to who you should bring issues up with. All enlisted are encouraged to bring complaints or issues up to any Warrant Officer. Warrant Officers are encouraged to bring any issues the Enlisted bring them or their own to Officers. The same applies to Officers reporting to Senior Officers, and Senior Officers reporting to Generals. The Generals will make the final say on decisions within the division. We are all a team within the division, and we will all work together to make this division successful and continue to strive. If for whatever reason no one is available to help you with an issue or problem, then you should pm an officer or higher on the site. Only contact as a last resort on Ventrilo a General of another division. While they can take care of your situation or relay the information to the correct authority, it’s best to keep division related problems/issues within the division. Remember, each division has their own set of rules outside of the clan rules, and handle things a little different from time to time. Teamspeak will still follow the same rules given throughout the entire clan. Bm is still not tolerated under any circumstance, however you have a few more tools at your disposal. If for whatever reason there is someone you don’t get along with in TS, it’s usually best to mute them so you don’t even have contact with them. While D2jsp.org is not a requirement within Overdosed,you are encouraged to be active in JSP and learn its mechanics. All d2jsp rules will apply when making bids, or buying items on JSP. We have a guild on jsp. All OD members are welcome to join the guild. You will be given a rank based on what your rank is in Overdosed; General, Senior Officer, Officer, Warrant Officer, or Enlisted. Please do not ask for fg or post donation requests in the main channel. Any and all violations of these rules can be reported to any Officer, Senior Officer, or General. When you bring a report of any of these rule violations, bring enough proof with you. Proof can be anything from a Screenshot, recording, date and time (If it happened in the clan channel. The ops owners can check their logs.). Interested in joining our Runs Squad? Read more about it here! Hi Lady's and Gentlemen ,I wanted to bring you a revised runs squad up date. do you want to be a part of the amazing crew that does runs? Then here's your chance to join the run squad and stand up and take the initiative in hosting live runs for your clan mates and people who will follow your runs. Doing runs is a good way to show that you are active and dedicated to the clan and also a way to bring in possible new recruits that may want to join a gaming community like clan OD. If you are logged into the runbot and doing runs...then you must be the one doing the runs...tele and getting to baal or thru chaos is your responsibility. Are the same as clan rules but here are a few. 1. No logging on to run bot and follow some one else's runs to count for your runs. 2. If you are playing scl or hcl you can pass word it if spam bots are preventing people from following your runs. But it is wise to do a few public runs before pass wording and let your followers know you are going to password it and say clan od to follow runs . the password is always OD .And if you have a problem with someone pkin your run's after you put Password OD on your run's then write down there account name and find a officer or colonel or major they can warn that person an then if they continue they will be kicked and if necessary banned from channel. 3. Please when you are doing run's in public channel ." Welcome to clan OD runs" , and when the run is over,advertise our channel "clan OD for more legit runs!" 4.Always remember you represent the clan so NO BM. 5. There will be a 25 minimum of run's to the runs squad to stay a member of the runs squad. Do these look blank and have to be highlighted to read, or is it just me? What it looks like to me Onee. Just gotta hit reveal. This topic is now marked as resolved and has been moved to the Trash can. If you feel your problem/situation was not fixed or finished please get in contact with a forum moderator. This needs to remain in the Diablo 2 division unless you're going to create a new and updated one. All divisions are required to retain a thread like this in their division forum. Took me forever to find this thread.... I'll be going through other divisions who don't have it either so you aren't the only ones. Excellent work @ogPoPs(OD)! We all appreciate your tireless work ethic and dedication to the team! And thank you @Aerineth(OD) for never forgetting your roots :), and your overall passion for this brilliant organization!! ..and as always thank you @Sassy for your faithful service and incomparable talent as our top recruiter! Don't ever lose that sass!! Thanks for the appreciation. It really does not go unnoticed. Wow, my bad! I never knew this post was here until today. I've recruited 5 people now and this would have been soooooooo helpful to be able to refer to. It seems to me that a lot of recruits have trouble with the overdosed.net registering process and having gone through it only once myself when I joined, their questions were hard to answer without another OD member in the channel with the answers. 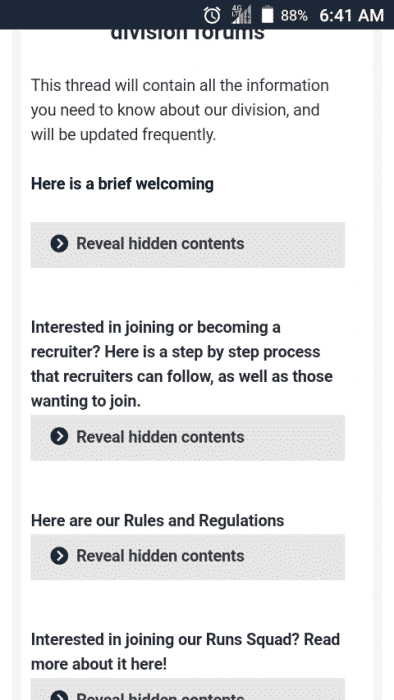 I realize that all Divisions have to have a section like this, however, a tiny suggestion would be to have a subforum for Recruiters where you direct people who are new to recruiting. I would also suggest that since we try to help all members get their new character up and running, perhaps Discos and others who perform classic rushes write up a small informational part so the new recruiter can explain it's availability to D2 members. Remember, not everybody knows the benefits to Crushes. I do because I used to play it, but the recruits I've talked to mostly don't know about it.